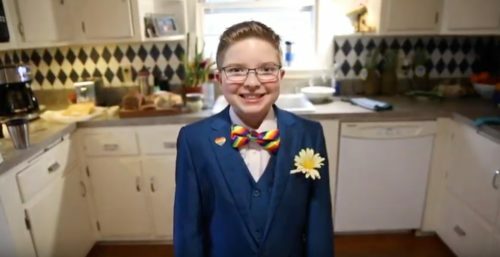 11-year-old Ella Briggs is the first out “Kid Governor” of Connecticut and she ran on a pro-LGBTQ platform in the election for fifth graders. The award-winning statewide initiative teaches the children civics and the winner is “sworn in” at the Old State House in the capital. “I will begin important conversations with students and adults all over this great state. We will talk about what it means to be accepting and respectful of everyone, including those of us in the LGBTQ community,” Briggs said during her swearing-in ceremony. 6,400 students from 87 schools participated this year, but some of her classmates at Ana Grace Academy of the Arts Elementary Magnet School in Avon refused to attend her swearing in. Some parents wouldn’t allow their children to attend. One teacher told her that it’s “not appropriate” to discuss LGBTQ issues in the program. But that didn’t stop Briggs from reaching for the stars – and proving that teacher completely wrong.